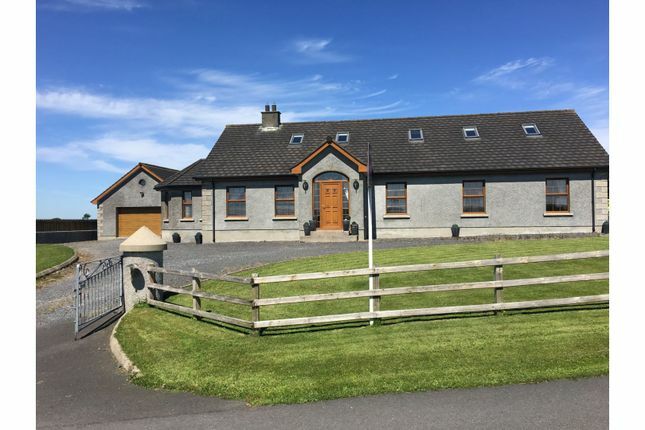 Stunning six bedroom detached chalet bungalow extending to 3000 square feet set on an elevated site and offering picturesque views towards the Mourne mountains and surrounding countryside. The property is modern and well presented throughout and on top of the six bedrooms offers an additional two receptions and sun room, fitted kitchen, four bathrooms, W.C., utility room and double garage with loft space above. The location of the property is rural but still offers easy access to Dromore and Banbridge whilst being only a 20 minute drive to Lisburn. The quality finish including solid oak internal doors, skirting and staircase combined with the space on offer is sure to appeal to purchasers and this home truly has to be seen to appreciate all it has to offer. Book your viewing 24/7 either on or by calling Marc Fegan on . Grand entrance hall with porcelain tiled floor. Storage cupboards x 2. Spacious lounge with feature open fireplace. Tiled floor. Modern fitted kitchen with an excellent range of high and low level units, island with breakfast bar, freestanding oven with six ring gas hob and extractor fan over, integrated dishwasher. Porcelain tiled floor. Well presented dining room with laminate wood floor. Spacious Sun Room with double French doors to rear and porcelain tiled floor. Small range of units, sink and plumbed for washing machine. Tiled floor. Modern downstairs facilities comprising dual flush WC and wash hand basin. Tiled floor. Double bedroom with En-suite facilities and laminate wood floor. Modern three piece suite comprising Jacuzzi power shower enclosure, dual flush WC and wash hand basin. Tiled floor and part tiled walls. Double bedroom with fitted wardrobes and laminate wood floor. Large modern four piece bathroom suite comprising Jacuzzi bath, wet room style shower, dual flush WC and wash hand basin. Chrome towel radiator, tiled floor and fully tiled walls. Spacious with eaves storage and desk area. Large, bright double bedroom with walk in wardrobe and En-suite facilities. Spacious room and modern suite comprising double shower enclosure, dual flush WC and wash hand basin. Chrome towel radiator, tiled floor and part tiled walls. Double bedroom with carpet. Access to Jack & Jill En-suite. Spacious double bedroom with lots of built in wardrobes along the right wall offering ample storage. Carpet. Access to Jack & Jill En-suite. Shared En-suite, modern three piece suite comprising dual flush WC, wash hand basin and panel bath. Tiled floor and part tiled walls. Spacious double garage with space for two cars plus storage. Light and power in place and also piped for radiators to be added if required. Electric door. There is also loft storage above. Large elevated site with pebbled driveway, large lawns and mature shrubs. Picturesque views over the mournes and surrounding countryside.